As of R1 2018 RadGridView supports pinning columns both on its left and right side. Prior this version, the FrozenColumnsCount property was available, through which columns could be frozen on the left side only. With the newer functionality this property is obsolete. It is replaced with the LeftFrozenColumnsCount and RightFrozenColumnsCount properties. 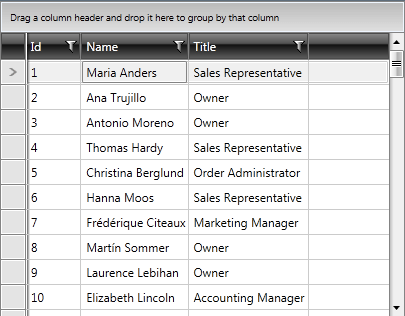 RadGridView provides an easy way to select one or more columns and exclude them from the horizontal scrolling. The frozen columns stay static on top of the horizontal scrolling. 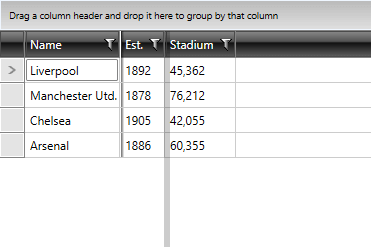 To freeze a column on the left, the user has to drag the left frozen columns separator. Once there is a frozen column, you can freeze other columns by dragging their headers behind the frozen columns separator. 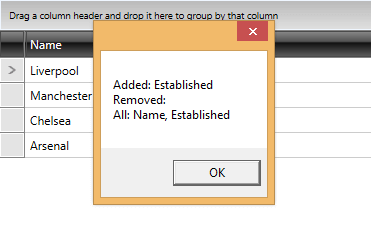 Similarly, you can unfreeze columns by dragging their headers outside the frozen columns separator. A frozen column always stays on top of horizontal scrolling. The approach of using the right side frozen columns is basically the same. The only difference is that the RightFrozenColumnsSplitterVisibility property of RadGridView needs to be set to set to Visible, as by default it is hidden. In order to programmatically freeze columns on the right side, the RightFrozenColumnsSplitterVisibility property needs to be set to Visible. You can freeze columns programmatically using the LeftFrozenColumnCount and RightFrozenColumnCount properties of RadGridView control. They are both numeric and you have to set them to the number of columns you wish to freeze. In Example 1, the first two columns are frozen starting from left to right. In Example 2, the first two columns are frozen starting from right to left. To disable the freezing of a column, just set the CanUserFreezeColumns to False (as shown in Example 2) and the frozen columns separator will disappear. You can set the FrozenColumnsSplitterVisibility property of the RadGridView control in order to hide/show the left frozen columns splitter. Hidden: Does not display the element, but reserves space for the element in the layout. Collapsed: Does not display the element, and does not reserve space for it in the layout. As of R1 2016, we've added the FrozenColumnsChanged event which is fired whenever columns are frozen or unfrozen. 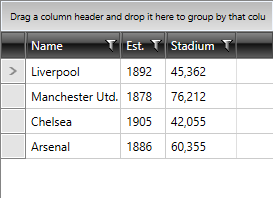 Example 4 shows how you can get the names of the columns currently in the frozen columns collection as well as the columns added or removed from it.